Wind down after your adventure on the deck or patio of one of our local establishments. Situated on Bird Creek and overlooking the Port Austin Harbor, PAK'S Backyard is a great place to relax with a Michigan craft beer after a long day of adventure! 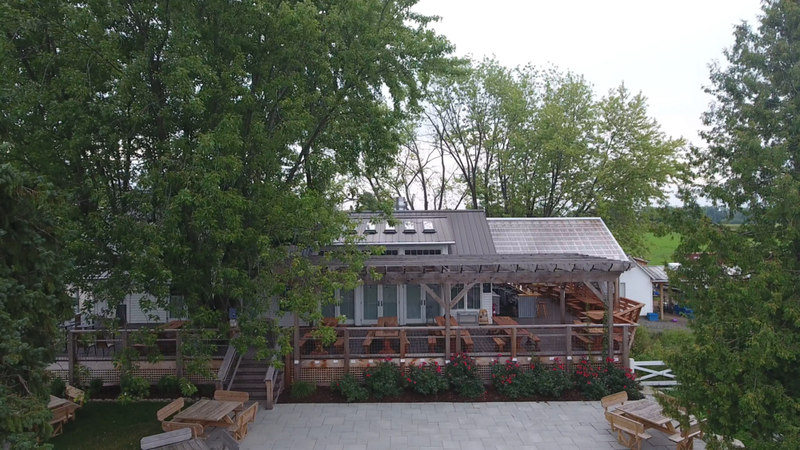 A serene space located on the Bird Creek Farm grounds, The Tap Room at Bird Creek Farms offers house made craft beer as well as selections from other Michigan craft breweries. Located in downtown Port Austin, The Bank 1884 offers a street side patio area that is perfect for enjoying a Michigan craft beer while soaking in the sites and sounds of the village. Shelly's Bar & Grill in Grindstone City is a very relaxed place with fun atmosphere. During the summer season, their outdoor patio is a great place to enjoy a MI craft beer! Located in nearby Grindstone City, Captain Morgan's outdoor patio overlooks their marina. A great place to enjoy a Michigan craft beer and watch today's catch come off the boats. They may not have outdoor seating, but they are some of our favorite places in the Port Austin area to grab a Michigan craft beer! A staple of the Port Austin area, The Farm offers fresh, thoughtful food in a relaxed country setting. Located right at the heart of downtown Port Austin, most of us would consider The Landing Tavern as our "local". Here for us locals all year long, serving great burgers and Michigan craft beer!